Gioiello means jewelry in Italian - a fitting name for this line of knobs and pulls. Gioiello is certainly cabinet jewelry for your home. 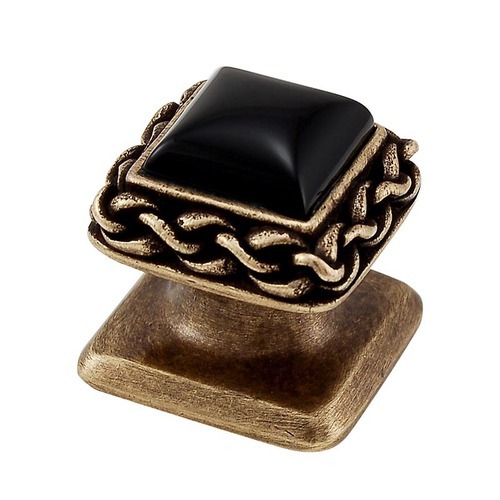 The small, square knob offers you the choice of stone inserts which include hematite, tiger's eye, black onyx, malachite, carnelian, and mother of pearl. Available finishes include Antique Brass, Antique Copper, Antique Gold, Antique Nickel, Antique Silver, Gunmetal, Oil-Rubbed Bronze, Polished Gold, Polished Nickel, Polished Silver, Satin Nickel and Vintage Pewter. Mounting hardware is included. 100% lead free pewter. Handcrafted in the USA. Gioiello means jewelry in Italian - a fitting name for this line of knobs and pulls. Gioiello is certainly cabinet jewelry for your home. The small, round knob offers you the choice of stone inserts which include hematite, tiger's eye, black onyx, malachite, carnelian, and mother of pearl. Available finishes include Antique Brass, Antique Copper, Antique Gold, Antique Nickel, Antique Silver, Gunmetal, Oil-Rubbed Bronze, Polished Gold, Polished Nickel, Polished Silver, Satin Nickel and Vintage Pewter. Mounting hardware is included. 100% lead free pewter. Handcrafted in the USA.